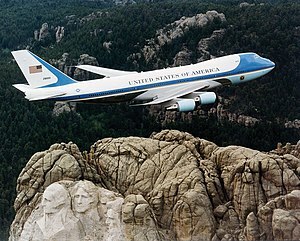 Air Force One, a Boeing VC-25, flying over Mount Rushmore. Boeing is a major aerospace and defense corporation, originally founded by William E. Boeing in Seattle, Washington. Its international headquarters has been in Chicago, Illinois, US since 2001. Boeing is the largest global aircraft manufacturer by revenue, orders and deliveries, and the second-largest aerospace and defense contractor in the world. Boeing is the largest exporter in the United States. Its stock is a component of the Dow Jones Industrial Average. ... that a political scandal erupted in 2014 after operatives of the Liberian National Security Agency illegally seized US$247,500 from a group of South Korean businessmen in a hotel room in Monrovia? ... that organic farmer Uroš Macerl won the Goldman Environmental Prize for leading a legal challenge against a cement company? ... that U.S. citizens are prohibited from engaging in business activities with Chhota Shakeel?